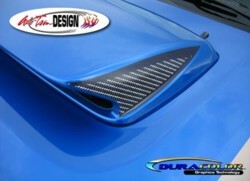 Detail your '04-'05 Subaru Impreza STi's Hood Scoop with these unique Simulated Carbon Fiber enhancement decals. Manufactured with our DuraCOLOR Graphics Technology, this three dimensional looking decal set will enhance the overall look as shown in the picture. The two (2) piece kit comes complete with one decal for each side of the scoop. Kit fits '04 or '05 Subaru STi's only.